As an artist, Tom Mosser is always looking around for ideas. In the alleyway dumpster near his studio a discarded tire became a paintbrush to get tread marks on his canvas. Mosser will present as part of Slippery Rock University’s Kaleidoscope Arts Festival, Thursday, April 19, beginning with an artist talk at 12:30 p.m. in the Smith Student Center Theater, followed at 2:15 p.m. with a demonstration at the Art Building, Room 006. Both events are free and open to the public. Many of Mosser’s clients are professional sports organizations. Using footballs to apply the paint, Mosser completed seven paintings for U.S. Bank Stadium in Minneapolis, where Super Bowl LII was played in February. He also contributed 36 pieces to Prudential Arena, home of the NHL’s New Jersey Devils, including a 200-foot-by-30-foot mural that is believed to be the largest interior mural in the world. Inspired by an Andy Warhol quote, the theme of Mosser’s talk at SRU is “ideas,” in that everything that people do is an idea, whether that’s what to eat for breakfast, a shot selection in tennis or, in Mosser’s case, how to create art. According to Mosser, the demonstration at SRU will be “very tactile,” as he will ask for audience participation, show samples of his work, create a piece using an SRU logo stencil and, of course, paint with balls on paper, canvas and fabric. Mosser is no stranger to engaging audiences or the sports world. From 1990-97 he was the Pittsburgh Pirates’ mascot, the Pirate Parrot, before becoming a full-time, self-employed artist, commissioned for fine art as well as working with commercial clients. 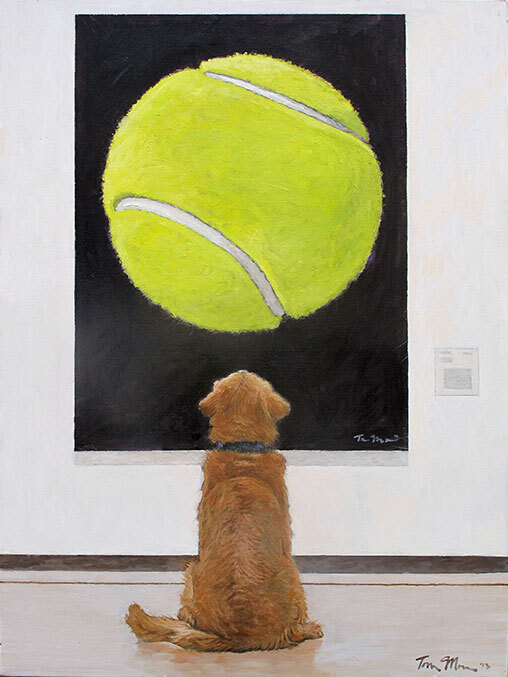 In addition to his sports murals, some of his most successful commissions include “A Golden Retriever at the Museum,” a depiction of his dog, Lucas, staring at a still life painting of a tennis ball, a painting that Mosser said changed his life. He has sold nearly 400 prints of “A Golden Retriever at the Museum,” including 100 in the first five weeks after an image of it went viral. Mosser donated $100 per print to charities including the Animal Rescue League. He has since created other iterations of the painting, including a pink tennis ball for breast cancer awareness. Mosser has also left his mark in Pittsburgh, where he moved after graduating from Penn State University and growing up in Huntingdon. The mural “The Two Andys,” created in 2005 with Sarah Zeffiro and located on the side of a downtown building on Strawberry Way in Pittsburgh, is a playful reimagining of city icons Andy Warhol and Andrew Carnegie sitting side-by-side in a beauty salon under hair dryers while getting makeovers. Mosser hopes his appearance at SRU will inspire artists as well as anyone else with ideas to pursue. For more information about SRU’s Kaleidoscope Arts Festival, please visit here. For more information about Mosser’s work, please visit here.